Last November, the Executive Producer and I marked our 25th wedding anniversary and agreed that a trip to NYC would be just the thing to mark the occasion . What with one thing and another, though, it took us until a month before our 26th to celebrate that silver milestone! What a celebration it was ... despite inclement weather, we saw and did as much as we could over a long weekend. OK, this is the part where I kick myself and y'all gasp in horror: I didn't bring my camera on the trip. 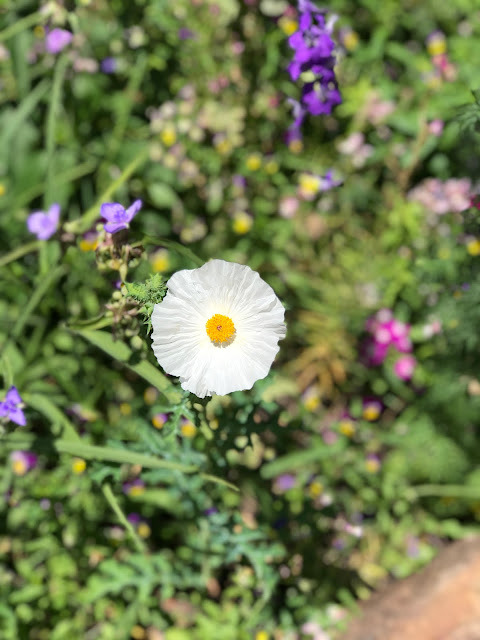 In my defense, I wanted to focus on seeing the city through my own eyes rather than a camera lens (and I also didn't want to be weighed down by i). Of course I regret that decision now but I did take a few shots with the iPhone. The shot at the top is of us walking through Strawberry Fields, the memorial garden for John Lennon. Since this was our first visit to NYC, we took the Gray Line bus tours that give you an overview of the city. We chose to sit up on top of the double decker bus, which explains the ponchos we're wearing: it was raining, it was windy, it was cold and we enjoyed it immensely! A word re hotels: the EP originally booked us into The Pod Hotel on 51st Street in Midtown, since it fit our budget and location needs. While the Pod's decor is very hip, the room was about as close as you can get to miniscule without being in Europe. After one night on a hard and uncomfortable bed, I called the Marriott Courtyard I'd spotted the previous evening and discovered that for only $6 more per night, we could have a spacious and comfortable room AND bed! The EP isn't big on doing research so in future, I believe I'll take care of that part of things. I was glad that we spent one night there, though, if only because of the view from our window. 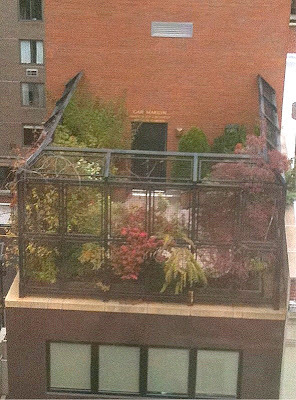 When I looked out on Saturday morning, this charming rooftop garden was just below us. I added some highlights and fill light so you could see details. Our final morning there, we ate breakfast at a local diner, which did not disappoint. (We both marveled at the fact that we had nothing but great meals our entire visit. It's not often you can say that.) The most disappointing thing about the entire trip, actually, was the fabulous weather on Monday, the day we left ... I wanted so badly to stay and spend the day walking around Greenwich Village or SoHo, ducking in and out of shops and restaurants, soaking in the beautiful fall day. It gives us a great reason to go back, though. Happy 25th anniversary, Cindy - or maybe that should be early wishes for #26? 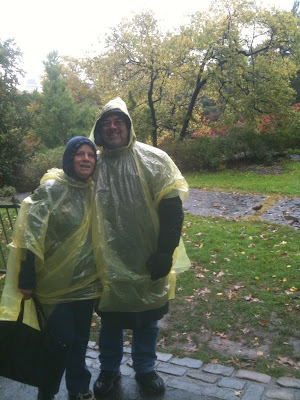 Your NYC trip looks wonderful - how cool you got to see Carrie Fisher, MOMA and walk through Strawberry Fields! It does indeed sound like a wonderful trip. Someday...the thought has crossed my mind about really seeing things vs seeing things through the camera lens. I applaud your bravery in going sans camera. I don't think I ever could. Happy Anniversary! What a wonderful trip to commemorate your 25th. I love that picture of the rooftop garden. Imagine stepping out into that garden for an early morning breakfast! How wonderful to celebrate a 25th anniversary in New York. Sounds as thouh it was totally enjoyable. Good food great views and a wonderful companion-who could ask for more!? Happy Anniversary! Thanks for sharing your experience...it sounds like it was just the thing despite the weather. Sounds like a great time. Aim for NYC for your 30th! You were so close....three hours! Happy anniversary a bit late and congrats. Love your outfits. Looks like one of my gardening getups.